WayTools today debuted the TextBlade, a compact, collapsible keyboard that's just a third of the size of an iPhone. Instead of using traditional keyboard layout, it uses "next-gen key switch technology" to allow users to type using just eight large smart keys that represent the entire alphabet. Described as the first MultiTouch keyboard, the TextBlade weighs 1.5 ounces and lasts for a month in between charges thanks to the lithium polymer battery built into the spacebar. Charging takes less than an hour and works through any USB port. 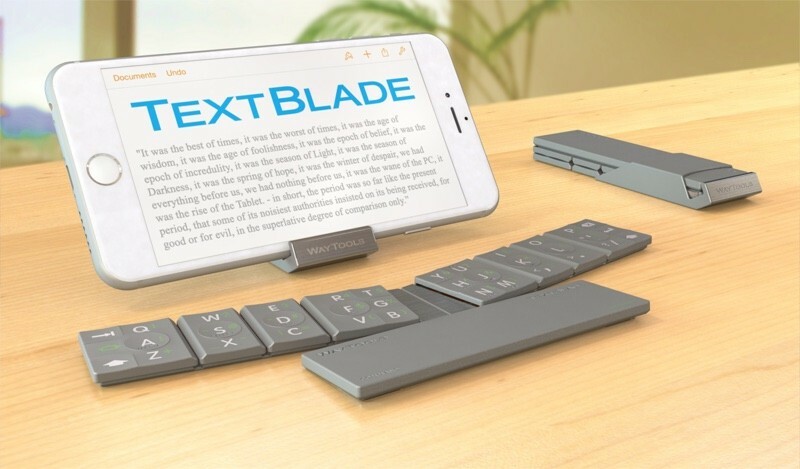 The TextBlade is collapsible and uses built-in magnets snap the pieces together into a form factor thats "as easy to carry as a pen," which was WayTools' main goal for the product. Its keys use a technology called "MagLever," which the company says is superior to a rubber spring keyboard with no drag, stretch, or wear. TextBlade is brimming with advanced technology, including the World's first physical MultiTouch Keys, ultra low energy Bluetooth Smart, and the first MultiLayer Keys, bringing symbols and editing to home row ... all engineered into the most compact touch-type machine ever produced. TextBlade uses the same character map as a traditional QWERTY keyboard, allowing people to use the same fingers to select the same letters as they would on a standard keyboard. This function makes typing on the TextBlade "instantly familiar" according to WayTools. The keyboard's eight smart MultiTouch keys are also described as "MultiLayer," allowing them to be used to select symbols and make edits quickly. All keys one might expect to find in an iOS-compatible keyboard, including keys for accessing audio controls and Siri, are included in the TextBlade. Keyboard covers shrink keys, and fatten your tablet. Not TextBlade.You get full 19mm finger spacing – the same as a desktop.Precision keys outperform a MacBook Pro, with full 2mm travel and extra large keytops. TextBlade's innovative frameless array eliminates all keyboard shudder, with rock-solid grip that hugs the table closer than a MacBook Air, so it's even easier on your wrist. TextBlade's ultra-low profile is half as thick as an iPhone 6. TextBlade can be pre-ordered from the WayTools website for $99, and will begin shipping out to customers in February.